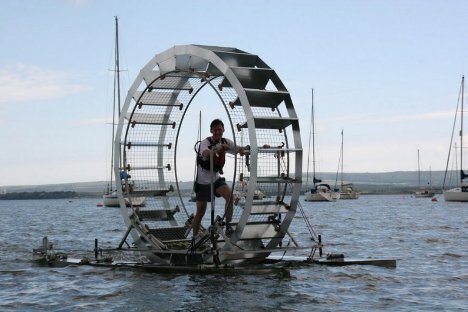 One very brave guy recently decided to walk over 66 miles of sea in a human-sized hamster wheel. 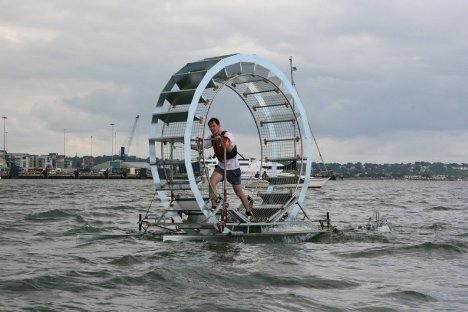 Chris Todd, the 35-year-old inventor of the Tredalo, took his kind of amazing vehicle out on the Irish Sea, leaving from Wales and planning to walk all the way to Dublin. 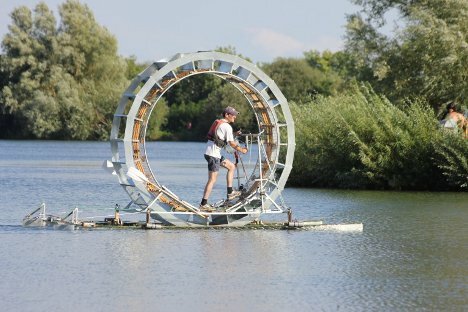 The Tredalo is more or less a raft that is powered by the human(s) inside walking or running. The person or people inside hold onto a hand rail as they walk. 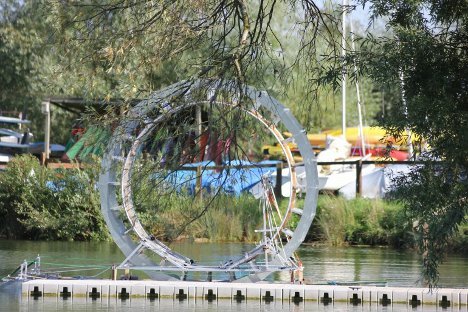 The huge paddle wheel provides the forward thrust to move the whole vehicle over the water. The Tredalo is intended to be used on lakes and other calm waters as a leisure vehicle. Todd, however, attempted to use it for a much more daring feat. Unfortunately, the Tredalo encountered waves much larger than anticipated and the rudders began to fail. The crew was unable to tow it back to shore and the Tredalo came to rest on the bottom of the sea. Under ordinary conditions, the Tredalo is much safer. It was designed to be stable even in rough conditions, and users can easily bail out if they encounter any serious problems. Todd is going to try to market the contraption to amusement parks as a unique ride, which we think is kind of a great idea. See more in Mods & Custom or under Transportation. October, 2012.